· Compatible with all FDM printers on the market that accept 1.75mm filaments including Prusa i3, Monoprice MakerSelect, X Creality and other RepRap printers. · With the right settings, the TPU is easy to print thanks to its excellent adhesion to the plate and the tendency of the filament to not deform. · Works best with direct drive extruders. Please print slowly and read the tips if you have a Bowden printer. · Description: SainSmart TPU filament is known for its high strength and flexibility. - With the freedom of design of 3D printing, SainSmart filament is the key to bringing your project, whether it´s a weekend hobby or prototyping for a Fortune 500 company, from sketchpad to reality. - Each SainSmart TPU filament spool comes with 0.8 kg of material. 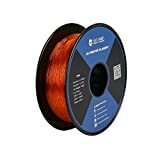 - This filament stretches to a diameter of 1.75 mm with a dimensional accuracy of + / - 0.05 mm, making it the perfect choice for most printers on the market. - Specifications: Diameter: 1.75 mm Material: Flexible TPU Net Weight: 0.8 kg Shore Hardness: 95 A. Recommended printer settings. Printing nozzle: 0.4 - 0.8 mm. Extruder temperature: 195 - 230° C. Printing plate temperature: 40 - 60° C. Cooling fan: On Printing tips for Bowden Drive printers. Print more slowly: 15 - 30 m/s. First layer setting: 100% height. 150% width, 50% speed Turn off retraction: You must reduce exudate and stringing Cooling fan: After first layer Increase Multiplier: 1.1, you should increase the joint Do not overextrude the filament during loading. As soon as the filament starts to protrude from the nozzle, stop it. Faster loading will cause the filament to get stuck in the extruder gear. - Pass the filament directly to the extruder, and not through the feed pipe. This reduces the rear strain on the filament as well as the resistance, ensuring proper feeding. - Package Content: 1 x SainSmart 1.75mm 0.8kg flexible TPU filament vacuum sealed with desiccant.